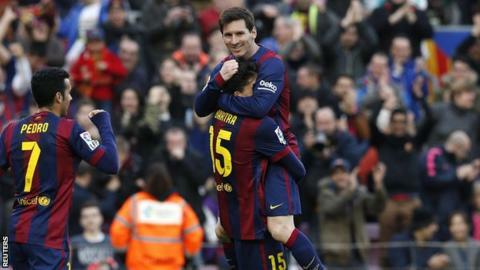 Lionel Messi scored his 23rd hat-trick on his 300th La Liga appearance for Barcelona who swept past Levante. The result means Barca are once again only a point behind leaders Real Madrid, who beat Deportivo La Coruna 2-0 on Saturday. Neymar scored the opener with an effort that spun in off his foot, before Messi drilled in, tapped home his second and then made it 4-0 from the spot. Luis Suarez scored the goal of the game when he acrobatically volleyed in. It was a stunning finish by the substitute that mirrored the excellent performance by Barca, who have now won their last 11 games in all competitions - equalling the streak in 2008-09 under then coach Pep Guardiola. Barca opened the scoring in rather fortunate circumstances when Neymar's strike, from Messi's delivery, spun up in the air before dropping just over the line. Less bizarre was the Barcelona's second. Messi was again alert to what was going on behind him, latching on to Marc Bartra's pass before firing in. And it was 3-0 14 minutes after the break, when the Argentine forward tapped in after Pedro brilliantly diverted Sergio Busquets's chipped ball into his path. The 27-year-old then completed his hat-trick with 26th league goal of the season - a penalty after Ivan Lopez had bundled over Neymar. The Brazilian was later taken off and replaced by £75m summer signing Suarez. The Uruguay forward, who had only scored four times this season, marked his cameo appearance with on outstanding goal, converting Adriano's cross from the left with a scissor-kick volley. "Records are obviously positive, but they don't interest me. "The players aren't overly euphoric because they know how hard it is to win titles. "If the fans are euphoric then great. We need to be optimistic, but it isn't important how many games we have won. What counts is if they help us to win trophies." Match ends, Barcelona 5, Levante 0. Second Half ends, Barcelona 5, Levante 0. Attempt saved. Jason (Levante) right footed shot from the right side of the box is saved in the bottom right corner. Assisted by Casadesús with a through ball. Corner, Barcelona. Conceded by Diego Mariño. Attempt saved. Lionel Messi (Barcelona) left footed shot from outside the box is saved in the top centre of the goal. Offside, Barcelona. Sergi Roberto tries a through ball, but Luis Suárez is caught offside. Substitution, Levante. José Mari replaces Pape Diop. Goal! Barcelona 5, Levante 0. Luis Suárez (Barcelona) left footed shot from the centre of the box to the bottom left corner. Assisted by Adriano with a cross. Corner, Barcelona. Conceded by Simao. Substitution, Levante. Jason replaces Iván López. Attempt missed. Xavi (Barcelona) right footed shot from outside the box is just a bit too high. Assisted by Pedro. Martín Montoya (Barcelona) wins a free kick on the right wing. Substitution, Barcelona. Luis Suárez replaces Neymar. Simao (Levante) wins a free kick in the defensive half. Goal! Barcelona 4, Levante 0. Lionel Messi (Barcelona) converts the penalty with a left footed shot to the bottom right corner. Iván Ramis (Levante) is shown the yellow card. Penalty Barcelona. Neymar draws a foul in the penalty area. Penalty conceded by Iván López (Levante) after a foul in the penalty area. Substitution, Barcelona. Sergi Roberto replaces Ivan Rakitic. Substitution, Levante. Casadesús replaces Kalu Uche. Offside, Barcelona. Ivan Rakitic tries a through ball, but Pedro is caught offside. Goal! Barcelona 3, Levante 0. Lionel Messi (Barcelona) right footed shot from the centre of the box to the bottom left corner. Assisted by Pedro. Attempt blocked. Pedro (Barcelona) left footed shot from the centre of the box is blocked. Assisted by Neymar. Attempt blocked. Xavi (Barcelona) right footed shot from outside the box is blocked. Assisted by Neymar. Iván López (Levante) wins a free kick on the right wing.